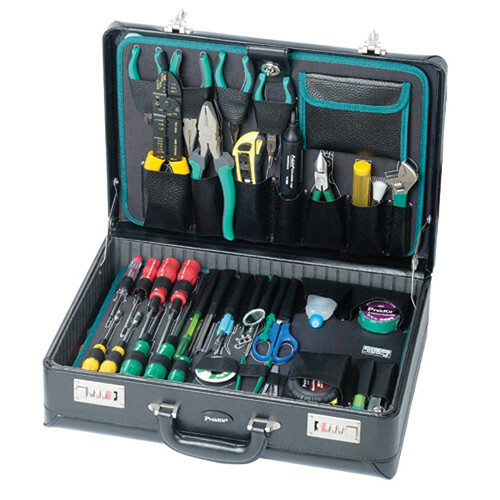 Ideal for performing most repairs of electronics, including smart devices and personal computers, the Eclipse Tools 57-Piece Electronics Master Kit contains a comprehensive set of tools needed for performing disassembly and repair work. Among many highlights are a soldering kit that features a soldering iron with a ceramic tip, soldering wire, electronics testing tools, a set of pliers, a Pro-Soft screwdriver kit, and many more. This kit is truly a self-contained set of tools that will serve you well with any electronics repair task. It is supplied in a well-organized portable custom briefcase with pockets tailored for each tool, a rounded handle with leatherette covering, and two metal combination locks. Box Dimensions (LxWxH) 18.3 x 14.2 x 5.4"
57-Piece Electronics Master Kit (Briefcase) is rated 5.0 out of 5 by 1. Rated 5 out of 5 by pbaronie from Electronics Master Kit by Eclipse Tools Purchased as a gift for my college child. He is going for an Engineering Degree in Audio Technology and possibly leaning toward Electronics. This is a perfect tool kit to have at hand to help him achieve his goals. The brief case is professional and organized. I hope he gets many years of use out of it.